Turf Valley is a luxurious golf and spa resort hotel in Ellicott City, Maryland, tucked in a wedge between Route 70 and U.S. Route 40. It is bordered by the beautiful David Force Natural Resource Area and conveniently close to the busy metro Baltimore-Washington DC corridor. This location makes it a premier destination for both corporate meetings and leisure retreats. Surrounded by the rolling hills of central Maryland, this hidden gem offers luxurious accommodations, fine dining, elegant event and meeting spaces, an indulgent spa and an 18-hole championship golf course. Add to this impeccable service and a warm, inviting atmosphere and you get the perfect resort hotel for conferences, social events, weddings, golf weekends and family vacations. Established as a horse farm, Turf Valley was purchased by the Mangione family in 1978 and following a country club model, fast became the area's leading catering and event establishment. The family continued to expand the organization by building a luxury hotel in 1988 and today, the 1,000-acre resort features a world-class hotel with two swimming pools, three full-size tennis courts, two championship 18-hole golf courses, a luxurious spa and over 40,000 square feet of meeting space. Turf Valley has 172 recently renovated guestrooms, including 70 luxurious suites, with chic décor and modern amenities to ensure absolute comfort and style, such as Keurig coffee makers and complimentary high-speed wireless Internet. Guests can choose from a variety of room or suite types to suit every taste and need, each with something unique to offer. Traditional guest rooms feature one queen size or two double beds, an en suite bathroom with shower and bathtub and a private balcony with beautiful views over the golf course. In-room amenities include flat screen televisions with pay-per-view movies, work desks and chairs, coffee makers, iron with ironing board, alarm clock and complimentary wireless Internet. Golf View Rooms offer spectacular vistas of both of the 18-hole golf courses and feature two queen-sized beds and an en suite bathroom with shower and bathtub. Queen Parlour Suites can sleep up to four guests with a queen-sized bed, a pull-out sleeper sofa and fully-equipped kitchenette. An en suite bathroom features a shower and bathtub and some rooms have balconies and/or handicap access. One Bedroom Suites offer more space with a separate bedroom featuring a king-size bed, a pull-out sleeper sofa and fully-equipped kitchenette. An en suite bathroom features a shower and bathtub and some rooms have balconies and/or handicap access. In-room amenities include two flat screen televisions with in-room entertainment and pay-per-view movies, work desks and chairs, Keurig® coffee makers, iron with ironing board, alarm clock and complimentary wireless Internet. Executive King Rooms take luxury and space a step further with a separate room with a king-size bed, a pull-out sleeper sofa, a fully-equipped kitchenette and/or study area with work desk and comfortable armchair. An en suite bathroom features a large custom-tiled shower and bathtub and double vanity, and some rooms come with balconies overlooking the golf courses. Executive King Suites feature a separate room with a king-size bed, a pull-out sleeper sofa and a fully-equipped kitchenette. An en suite bathroom features a Jacuzzi soaking tub and separate shower with wheelchair accessibility. Two Bedroom Suites offer guests two separate bedrooms with a king-size bed in one room and a queen-size bed in the second room. These suites also offer a pull-out sleeper sofa, a fully-equipped kitchenette with microwave, mini fridge, sink and cabinets and a spacious dining area. Some suites offer balconies with lovely views over the golf course. Hospitality Suites are large and spacious and feature one separate bedroom with two queen-size beds, two pull-out sleeper sofas, a fully-equipped kitchenette with microwave, mini fridge, sink and cabinets and a separate dining area. Some suites offer balconies with lovely views over the golf course. Turf Valley also offers an extended-stay home away from home with all the amenities of a resort getaway with a range of luxury villas located high above the emerald greens of Turf Valley's lush fairways. Reminiscent of an Old World country estate, spacious two- or three-bedroom golf villas features large arched doorways, distinctive décor, marble foyers, luxurious en suite bathrooms with Jacuzzi baths, spacious fully-equipped kitchens and gas fireplaces. Private balconies or patios overlook the golf courses and there is an optional housekeeping service. Villa guests have access to all hotel facilities, including the tennis courts, pool and fitness. Open to both the public and guests at the resort, Alexandra's Restaurant boasts beautiful views over the impeccably manicured golf greens and serves an innovative menu of American fusion cuisine with inspired reinventions of dishes from around the country. Alexandra's talented Executive Chef Chris Vocci creates a menu of mouthwatering selections featuring inspired reinventions of classic regional specialties, as well as a variety of traditional favorites. Signature dishes on the dinner menu include grilled Mahi-Mahi tacos served with avocado sour cream and hand-cut fries, Delmonico USDA Prime Angus Beef steak sourced from Creekstone Farms, Louisiana shrimp & grits with house-cured Tasso ham and tomato Andouille cream, and pan-roasted Chilean sea bass with fingerling potatoes and lobster cream. The Spa at Turf Valley offers guests the perfect way to relax and rejuvenate in serene and comfortable surroundings. Featuring an indoor swimming pool and separate ladies' and men's saunas, the spa offers a range of services including massages, body treatments, facials and facial enhancements, skin care, manicures and pedicures. Signature treatments include deep-tissue full-body massages, refreshing Vichy showers and self-renewing facials with eye and lip treatments. Couples looking for a romantic retreat can enjoy special spa packages with a private suite. 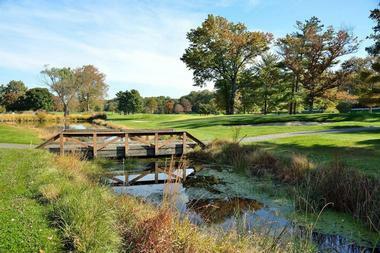 Ideal for golf vacations, corporate retreats and weekend getaways alike, resort amenities at Turf Valley include two 18-hole golf courses, a golf school, a membership-based golf club and a full-service pro shop. The hotel is also home to a luxury spa and wellness center, three tennis courts, a volleyball court and a basketball practice area, an indoor and outdoor swimming pool, a 24-hour Fitness Center, a sports field for neighborhood activities and team-building events and a nature trail. Turf Valley offers exceptional event and meeting facilities for a variety of special occasions from weddings and receptions to conferences, team building activities and golf weekends. Turf Valley offers several different ballrooms and an array of scenic locations and wedding packages for the special day and events surrounding it such as bachelor and bachelorette parties, receptions and honeymoons. Exceptional venues include The Wedgewood, which is a 2,544 square foot ballroom for up to 140 guests that features exquisite sparkling crystal chandeliers and an open reception area next to the ballroom. 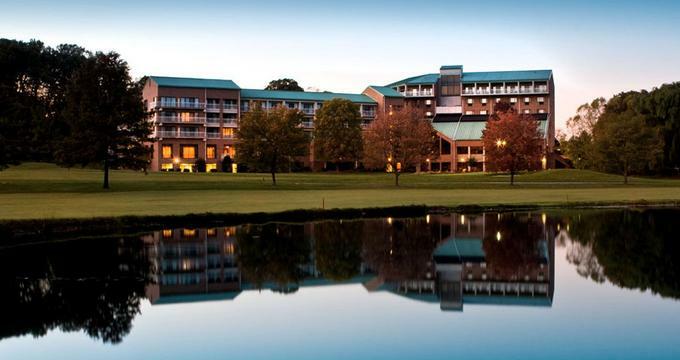 Surrounded by scenic views overlooking 18th hole of one of the world-class championship golf courses, The Waterford offers a 3,344 square foot ballroom for up to 200 guests, as well as a private reception area that includes a balcony with breathtaking views. The Cameo Ballroom offers 4,505 square feet of space for up to 250 guests and boasts well-appointed décor with a private bridal suite and open reception area next door. The Grand Ballroom is the largest ballroom at Turf Valley with over 9,472 square feet of space for up to 600 guests, six spectacular chandeliers and a private bridal suite. The Crystal and Tiffany Ballrooms can house up to 170 guests in a 3,552 square foot ballroom, and have two beautiful crystal chandeliers and private bridal suites. The Regency Ballroom seats up to 80 guests, but can be combined with the Tiffany or Crystal for up to 300 guests and also enjoys a private bridal suite. Every year in January, Turf Valley offers an exciting evening for prospective bridal couples and wedding planners with over 80 wedding service exhibitors showcasing their work and wares. The evening begins with hot and cold hors d'oeuvres, an open bar and elegant three-course seated dinner followed by a runway fashion show featuring wedding dresses, accessories, honeymoon wear and more from a variety of top bridal brands. Turf Valley offers a range of packages for leisure and business travelers. For business travelers, the hotel offers a Preferred Corporate Account Program, which includes exclusive reservations and rates, business center access, including complimentary printer and fax services, complimentary high-speed wireless Internet and a discounted shuttle service to and from the airport. Other bonuses of the package include discounted spa services, discounted Enterprise Rent-a-Car rates and preferred pricing for all meetings and social events. Leisure travelers can enjoy a variety of packages including Wine Tasting, Military Appreciation and Girl’s Night out Packages. The Black Ankle Winery Tour Package includes a Black Ankle Winery Tour & Tasting, a picnic lunch for two, a bottle of local Black Ankle wine, dinner at Alexandra's Restaurant and luxury accommodations at the hotel. The Military Appreciation Package offers a special getaway for military personnel, including overnight accommodations in the hotel and dinner for two at Alexandra's Restaurant with two drink coupons. The Girls' Night Out Package includes appetizers and dinner in Alexandra's Restaurant, luxury accommodations at the hotel and a complimentary wine and cheese platter. Turf Valley is an eco-friendly resort and practices sustainable and green initiatives throughout the hotel and its surroundings. Green practices include offering environmentally friendly, 100% biodegradable Green Natura in-room amenities, recycling receptacles and a linen and towel reuse option, water-saving showerheads and faucet aerators in all bathrooms, blackout drapes and window tinting, among others. Wedding and conference facilities also feature sustainable and green initiatives, including recycling paper, cardboard, plastic and glass, composting food waste, paperless contracts and billing options and recycling bins in public areas and all guest rooms and suites. Back to: Weekend Getaways from Washington, DC.